ArkivMusic is an online retailer sells classical music online. Depending on the work, the piece of music might be streamed, delivered on a digital disk, or even delivered on vinyl. Tempe is a city in the metropolitan area of Phoenix. The city is named for the Vale of Tempe in Greece. Uri Geller’s most famous performance is perhaps his uncomfortable failure on “The Tonight Show” with Johnny Carson in 1973. Carson “hijacked” Geller on live television by providing him with spoons to bend and watches to start, none of which had been available to Geller before the show aired. Clever! Alessandro Volta was the physicist who invented the first battery, way back in 1800. One of Volta’s first applications of his new invention was to use a battery (and a very long run of wire between the Italian cities of Como and Milan) to shoot off a pistol from 30 miles away! Odense is a city in Denmark, named after the Norse god Odin. One of the most famous sons of Odense was Hans Christian Andersen, the celebrated author of children’s stories. To be on the lam is to be in flight, to have escaped from prison. “On the lam” is American slang that originated at the end of the 19th century. The word “lam” also means to “beat” or “thrash”, as in “lambaste”. So “on the lam” might derive from the phrase “to beat it, to scram”. Superman’s comic book creators gave their title character’s alter-ego the name “Clark Kent” by melding the names of Clark Gable and Kent Taylor, two leading men of the cinema at the time Superman was created. However, they modeled Clark’s character more on the silent film actor Harold Lloyd. Actor Peter Krause is perhaps best known for his TV work, and in particular for heading the cast of the HBO show “Six Feet Under”, and more recently for working alongside Angela Bassett on the police drama “9-1-1”. Krause started a relationship with fellow actor Lauren Graham in 2010 while they were playing brother and sister on the show “Parenthood”. The dinar is the official currency in many countries, such as Iraq, Tunisia and Serbia. The gold dinar dates back to the early days of Islam, with the name deriving from the Roman currency called “denarius” meaning “ten times” (as it was originally a coin worth ten asses). The North African nation of Tunisia takes its name from its capital city Tunis. Present-day Tunisia is roughly equivalent to the Roman province known as “Africa Proconsularis”, which gave its name to the whole continent. “Bistro” was originally a Parisian slang term for a “little wine shop or restaurant”. Ken Jennings is a remarkable man, the person who had the longest winning streak on television’s “Jeopardy”. He has also won more game show money than any other person. He was defeated after 75 appearances on the show, after racking up over $2.5 million in the prior episodes. 49. Spa emanation : AAH! Weimar is city in Germany, one that is perhaps best known as the location of the signing of the country’s first democratic constitution. The German state that resulted is known unofficially as the Weimar Republic. Franz Liszt was a Hungarian composer and a fabulous pianist. Particularly towards the end of his life, Liszt gained a tremendous reputation as a teacher. While he was in his sixties, his teaching profession demanded that he commute regularly between the cities of Rome, Weimar and Budapest. It is quite remarkable that a man of such advanced age, and in the 1870s, could do so much annual travel. It is estimated that Liszt journeyed at least 4,000 miles every year! The oft-quoted statement “Veni, vidi, vici” (“I came, I saw, I conquered”) is believed by many to have been written by Julius Caesar. The words date back to 47 BCE and refer to the short war between Rome and Pharnaces II of Pontus. “Étape” is the French word for stage, as in a “stage” in the Tour de France. The term is used in English military circles to describe where troops halt overnight, but can also describe the section of the march itself. So, a march can be divided into stages, into étapes. A bigwig is someone important. The use of the term “bigwig” harks back to the days when men of authority and rank wore … big wigs. Neale Fraser is a former tennis player from Australia. Fraser won Wimbledon in 1960, and the US Open in 1959 and 1960. He also captained the Australian Davis Cup team for 24 years, during which Australia won the tournament four times. Notably, Fraser won the singles, doubles and mixed doubles title at the 1959 US Open (then known as the US Nationals). Remarkably, Fraser repeated the feat the following year. No one else has ever won the singles, doubles and mixed doubles in a Grand Slam tournament in the same year, never mind two years in a row. The suffix “-itis” is used to denote inflammation, as in laryngitis (inflammation of the larynx), otitis (inflammation of the ear), tendinitis (inflammation of a tendon), tonsillitis (inflammation of the tonsils) and sinusitis (inflammation of the sinuses). The voice box or larynx is where pitch and volume of sound are manipulated when we talk. The structure called the Adam’s apple that protrudes from the human neck is formed by the thyroid cartilage that surrounds the larynx. The Adam’s apple of males tends to increase in size during puberty, so the feature tended to be associated more with males in days gone by, perhaps leading to the name “Adam’s” apple. A doctor specializing in treating the larynx is a laryngologist. In the world of computing, a router is a device that helps direct traffic, as it were. A router in a house is often found in combination with a modem, and directs traffic between the Internet and the computers in the home. “Wi-Fi” is nothing more than a trademark, a trademark registered by an association of manufacturers of equipment that use wireless LAN (Local Area Network) technology. A device labeled with “Wi-Fi” has to meet certain defined technical standards, basically meaning that the devices can talk to each other. The name “Wi-Fi” suggests “Wireless Fidelity”, although apparently the term was never intended to mean anything at all. Leica is a German optics company that is famous for production of lenses and cameras. The 1913 Leica was the first practical camera that could use 35mm film, a size chosen because it was already the standard for film used in motion pictures. “Ergo” is a Latin word meaning “hence, therefore”, and one that we’ve absorbed directly into English. Basketball is truly a North American sport. It was created in 1891 by Canadian James Naismith at the YMCA in Springfield, Massachusetts. His goal was to create something active and interesting for his students in the gym. The first “hoops” were actually peach baskets, with the bottoms of the baskets intact. When a player got the ball into the “net”, someone had to clamber up and get the ball back out again in order to continue the game! Iwo Jima is a volcanic island located south of Tokyo that today is uninhabited. The name is Japanese for “Sulfur Island”, referring to the sulfur mining on which Iwo Jima’s economy once depended. There were about a thousand Japanese civilians living on the island prior to WWII. In 1944, there was a massive influx of Japanese military personnel in anticipation of the inevitable US invasion. As the Japanese military moved in, the civilians were forced out and no one has lived there since. Control of the island was wrested from the Japanese in the five-week Battle of Iwo Jima in 1945. Said battle was one of the bloodiest in the Pacific theater in WWII. “La-la land” is a euphemism for a state of unconsciousness or a dreamworld. The expression “space cadet” is used to describe someone who is eccentric and disconnected with reality. It may even imply that the person is a user of hallucinogens. The phrase has been around since the sixties, and may be derived from the science fiction TV show “Tom Corbett, Space Cadet” which aired in the fifties. Actor Erik Estrada’s big break came with the movie “Airport 1975”, in which he played the doomed flight engineer of a Boeing 747. A couple of years later, Estrada began a six-year gig, co-starring on the television show “CHiPs” as motorcycle police officer Poncherello. The TV cop show “CHiPs” ran from 1977 until 1983. Stars of the show were Larry Wilcox and Erik Estrada, who played two California HIghway Patrol (CHP) motorcycle officers. I find it interesting that the storylines never once called for the officers to draw their firearms over the six seasons (how shows have changed!). Erik Estrada had to learn how to ride a motorcycle for the show, but wasn’t licensed to drive one during the whole of production. He eventually qualified, but only after three attempts to pass the test. Our word “sky” was originally an Old Norse term meaning “cloud”. The French franc was made up of 100 centimes, before being replaced by the Euro. CK One is a fragrance that was developed for Calvin Klein and launched in 1994. It was to become the first really successful unisex fragrance. Universal Serial Bus (USB) is an industry standard dealing with how computers and electronic devices connect and communicate, and deal with electrical power through those connections. Roberto Durán is a retired professional boxer from Panama. He earned the nickname “Manos de Piedra” (Hands of Stone) during his very successful career. Durán retired in 2001 after being involved in a car crash which required life-saving surgery. Tech Data is a company that provides IT products and services. We’re probably more familiar with the companies with which Tech Data does business (Apple, Cisco, HP, IBM, etc), rather than Tech Data itself. “Fortune” is a tri-weekly business magazine that was founded by Henry Luce in 1930, just four months after the 1929 Wall Street Crash. “Fortune” is noted for its annual ranking of companies by revenue, especially the Fortune 500. The fur of the sea otter is exceptionally thick. It is the densest fur in the whole animal kingdom. The sport of polo originated in Iran, possibly before the 5th century BC. Polo was used back them primarily as a training exercise for cavalry units. The mai tai cocktail is strongly associated with the Polynesian islands, but the drink was supposedly invented in 1944 in Trader Vic’s restaurant in Oakland, California. One recipe is 6 parts white rum, 3 parts orange curaçao, 3 parts Orgeat syrup, 1 part rock candy syrup, 2 parts fresh lime juice, all mixed with ice and then a float added of 6 parts dark rum. “Maita’i” is the Tahitian word for “good”. “Chisel” is a word used as slang for “cheat, defraud”. The slang term originated in the early 1800s, and might possibly come from the idea of gouging someone, cheating the person out of money. The first World Series of baseball in the so-called “modern” era was played in 1903, between the Pittsburgh Pirates of the National League and the Boston Americans (now the Red Sox) of the American League. Boston emerged victorious by five games to three. As we all recall from chemistry class, a pH of 7 is considered neutral. Anything less than 7 is an acid, and anything above 7 is a base. 7. “So THAT’s what’s going on here!” : I SEE! Maybe these are clues to something bigger, but at least twice this week the clue had a part of the answer root word within it. Today it was 35 down: IT=information TECHnology in the clue; TECHdata the answer. Is this just sloppiness, or is there a bigger puzzle going on? 54A, Military camp: ETAPE? I have never heard this word used. Even after Bill’s explanation, I am flummoxed. Guess i need to find some English military friends. Found it only on crosses. LAT: 13:48, no errors; totally missed the theme. Newsday: 8:09, no errors. WSJ: 25:45, no errors; took me a long time to grok the gimmick. BEQ: 12:41, no errors; an easy Valentine’s Day gift except for one cross I had a little trouble with. NYT: 9:13, no errors; rather easy for a Thursday. Fine Thurs puz by the great Bruce Haight … cool run of 10 themers on the edges of the grid, not stuffed with crosswordese, fairly clued. LAT 31:15 no errors . Never did pick up the theme. A lot of obscure clues picked up on crosses. NYT # 0110 from my paper today 35:45 no errors. Getting the theme helped on this one. No great shakes on time again and found it pretty hard. the rest we just did not know. Enjoyed the struggle. Thought theme would have to due with Valentines Day. Xoxo’s, but it’s about tools, must be a guy thing. Everybody Wang Chung tonight. Hammer, chisel, file…sounds very Freudian, doesn’t it? That too. I’m sure glad my guy just brings chocolate. 16:13. A few good guesses helped me on this one. I didn’t notice the theme either. Solved like a themeless. I think ETAPE’s connection to a military camp is in that it is a “staging area”. That, I assume, is its connection to the French. Dave – The tequila was great. It’s clear so I thought it was a blanco, but it is indeed an anejo. It’s what they call an “anejo claro” which I had never tried before. It was very smooth. @Jeff … I’m glad to hear that my tequila has found its way to an appreciative owner. I’ve been doing some research on extra añejo tequilas (what I should have done instead of giving in to an impulse). Prices and quality seem to be all over the place … very confusing … perhaps I’ll have to wait until the next time I’m in Cozumel … 😜. 13:59 and five errors in this, the second puzzle in a row jammed with highly arcane, specialized-knowledge fills. It may be Valentine’s Day, but I am *not* loving it. LAT: 27:07, no errors. WSJ: 28:21, no errors. Newsday: 9:02, no errors. BEQ: 14:19, 2 errors, more or less bad corners involving 41A. Fireball: 37:10, DNF, no errors. Had similar troubles to the BEQ with a 2×2 block around 31A I couldn’t even hazard guesses on. Fair enough effort for me that I keep solving these “well enough” anyway. And since I can’t post to the other blog, some NYT Syndies – for those that watch that blog and don’t know, I get them some time after publication so there’s a day or few delay when I show up: Mon (0107): 6:39, 1 error (Natick 66A-47D). Tue (0108): 7:22, no errors. Wed (0109): 13:43, no errors. A tough puzzle. I had a tough time. Thank you Bill for your lovely blog – I learned a whole hell of a lot – and that was the biggest fun part of all. I hope you are keeping well and everything is all right for your folks, and back in Ireland. We should think of you more often !!! Have a great evening and a nice day all you folks. @Dave – I agree. Rules is rules. @Kenneth – ETAPE is a crossword word, like ETUI or OMOO. @Mary – There was a theme? You can also use Google to search for “rules for crossword puzzle construction” and check out some of the hits that turn up, like the ones on Wikipedia. In any case, there are few of the basic rules that are not broken at times, if the design of the puzzle calls for it. Moderately easy Thursday for me; took about 25 minutes with one careless omission. Had a bit of trouble in the NW but eventually straightened it out. Had to change kodakS to LEICAS, reRATE to UPRATE and fix MALLoT. My omission was C_ONE, the fragrance which I’m not familiar with but the cross looked like it should have been KRAUSE, if I would’ve revisited it… Other than that it was pretty easy. @Carrie – What’s up, did your cold reoccur? Hope things are going okay. Great theme which I actually did not even notice till coming here! 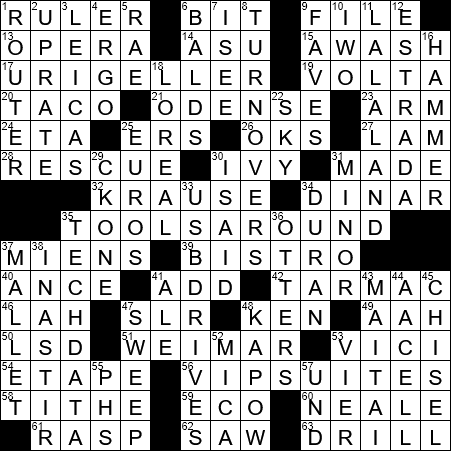 I wish I had…sometimes I do puzzles so desultorily (word?) — just a little here and there thru the day, and I miss the theme. Hey Dirk! I’m A-okay; I just couldn’t access the site yesterday!! Twas about 1:30 a.m. and the site appeared to be down for at least 20 minutes– I had to give up trying at a certain point.